Personalized Rainbow Pocket Knife | BUDK.com - Knives & Swords At The Lowest Prices! If you're looking for the perfect gift for anyone, you've found it. 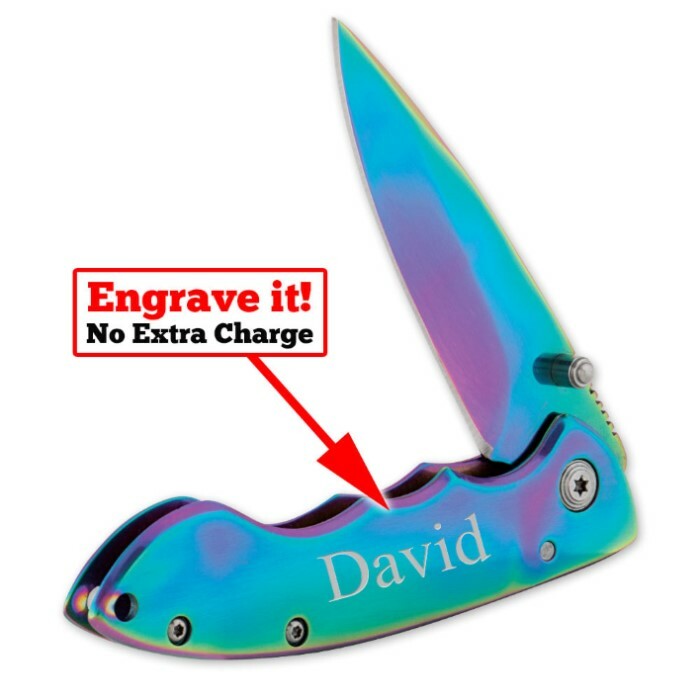 This personalized pocket knife is only $12.99 and that includes the personalization! Have a name or message laser etched on to the beautiful rainbow tini finished handle of this knife to show that special someone that you really care. Whether it's a groomsman, husband or someone graduating or getting married, this is the perfect gift to commemorate the occasion. Get yours now before it's too late! You will not be disappointed! I wanted to buy a good but colorful knife for my daughter to carry in her purse every day. She lost her last one to airport security. She likes this one because of it's colors and it has her name on it. She also likes the sturdy feel and it's easy opening. I wanted to to my cub Scouts a good knife as a final,Christmas gift from their cub Scout pack. These were perfect. Good quality and each of my boys loved that their names were on them! I couldn't be more pleased with my purchase!